The What: RTI’s all-new KX10 in-wall touchpanel is now shipping. Specifically designed to bring simple control and automation to AV, environmental, and security systems, the KX10 combines the capabilities of a control device and a high-definition video display into one interface. The What Else: The KX10’s large, 10.1-inch, 1280x800 WXGA-resolution LCD is programmable to the finest detail and provides ample screen real estate for custom user interfaces. Developed to be an elegant solution that allows users to efficiently engage with their surroundings, the touchpanel enables control over local devices via built-in IR and RS-232 outputs. The unit also features built-in intercom support, a proximity sensor that brings it to life when a user approaches, and an ambient light sensor that automatically adjusts screen brightness. For integrators, built-in wireless ethernet enables them to set up the KX10 easily in retrofit installations, while the wired 10/100 Base-T ethernet provides the flexibility of power over ethernet plus. 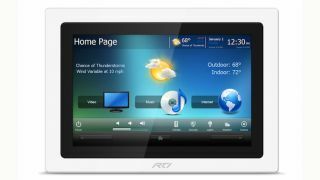 The Bottom Line: The user interface can be custom-tailored to provide a control experience that meets the specific needs of any installation using RTI’s Integration Designer software. With the software’s drag-and-drop simplicity and two-way drivers, installations are streamlined and third-party electronic systems can be easily integrated to create a robust, cutting-edge automation system.